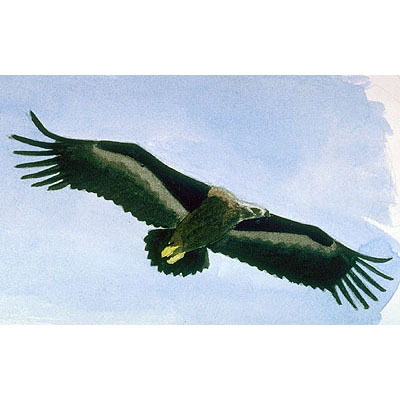 Size (L 105 cm) and flight silhouette like Griffon Vulture (Gyps fulvus) but with brownish-black overall coloration and longer tail. The species normally breeds colonially on trees, mainly in evergreen oaks Quercus in mountainous areas at 300-1,400 m. Resident. There has been a marked decline and range contraction, with extinctions in several central and south-east European countries. The global breeding popualtion is about 1,000 pairs, of which 99% is in Spain. Habitat loss and alteration is a significant threat. Disturbance of nest-sites, predominantly through forest exploitation such as the creation of forest tracks or clearance of woodland is another serious problem, which can result in breeding failure.